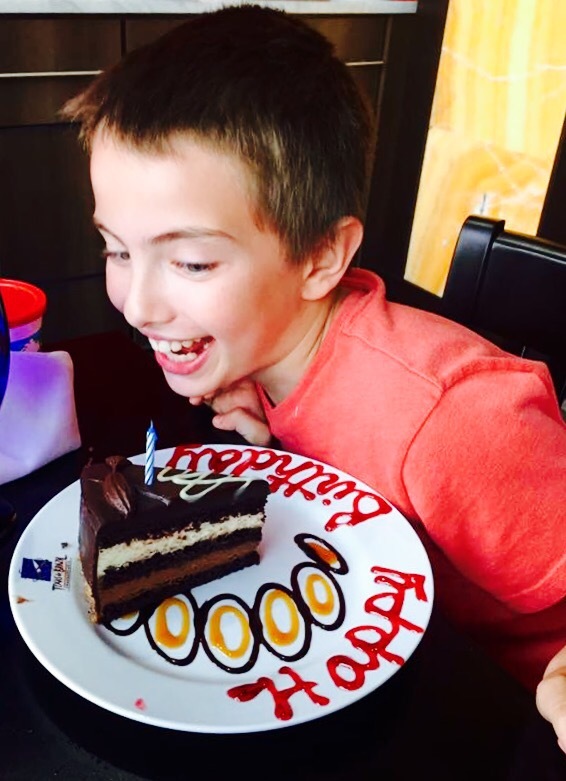 My great nephew, Ethan Barnes, turned 11 years old today. 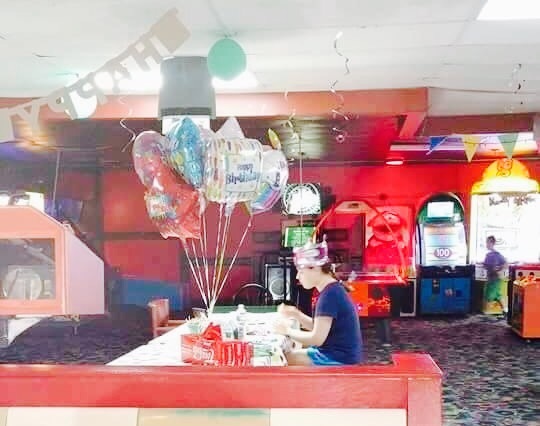 I didn’t get to see him on his special day, however we exchanged text messages and my thoughts have been on this bright young man as I prepared to write his birthday blog post. Ethan after a big birthday dinner tonight with his family. 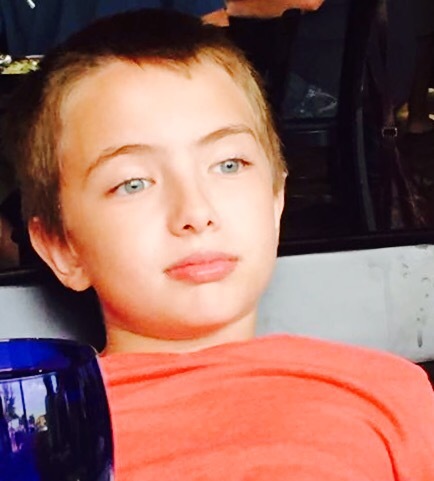 The grandson of my sister Debbie, Ethan lives with his family in Oklahoma. He is the older son of Ashley and Jon, and a wonderful big brother to Kaleb. 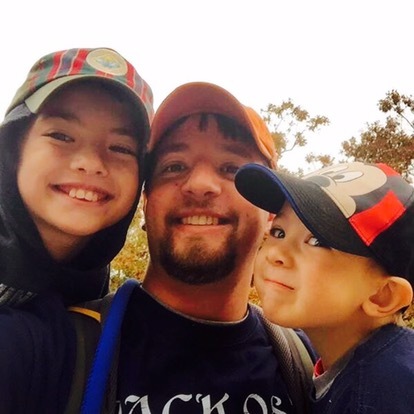 Smart, inventive and creative, Ethan excels in academics and he is well on his way to becoming an Eagle Scout. 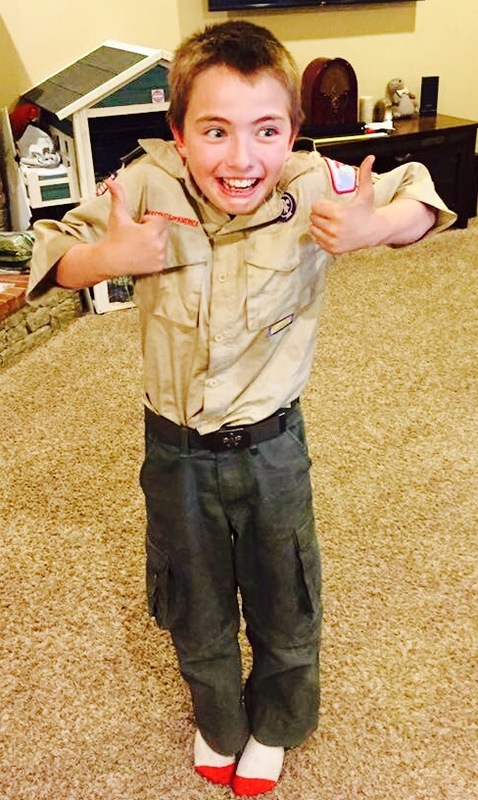 He’s already earned many merit badges and just returned from his first out of state Boy Scout camp. Halloween is a big deal at the Barnes’ house. I loved Ethan’s costume from Doctor Who. Ethan, you do well when you are in harmony however you are changeable when in discord, because many of your best qualities are then reversed. You are entertaining and may be impulsive. Freedom is a necessity, and you find it difficult to settle on one thing, creating restlessness. Your versatility may bring many changes and opportunities to travel. Your fine intellect is capable of high honors if applied seriously. You are capable of inspired thinking. Creative and outgoing, you are always looking for an opportunity to showcase your abilities, especially before an audience. You like to feel appreciated. You are looking for ways to communicate your ideas. You like to talk and can easily relate to different cultures and concepts. The biggest challenge for you may be that you are easily bored, causing you to move from one job or project to another. Your high creativity can lead you to happiness. If you pursue your goals, you can make major decisions in life without worry and uncertainty, and achieve great heights. Those are very powerful words for an 11 year old boy. And yet, I see Ethan growing into them already. He has a rich vocabulary, loves to sing and entertain his family, and already has a vast knowledge of the sciences and technology. I love to sit beside him, watching as he creates his own video games on his iPad. He’s a master at games like Minecraft. Like several in our family, this young man is very aware of energy and spirit, and shows strong intuitive abilities. While Ethan has always been a great conversationalist, this past year we’ve had some deeper conversations about life and the journey, and about being our own wonderfully unique selves and being okay with who we are. 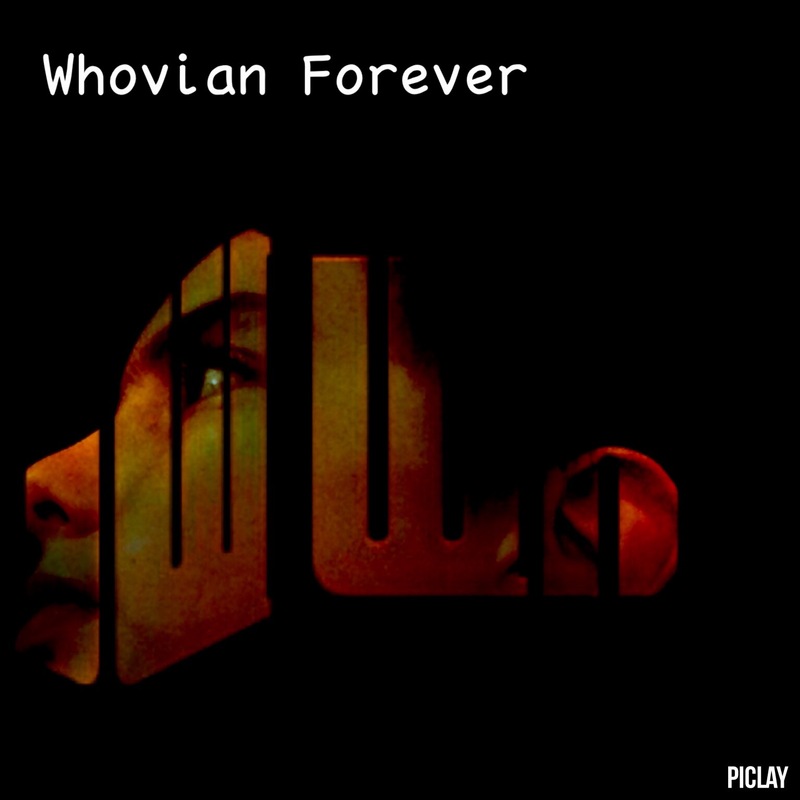 Ethan became a Doctor Who fan recently and I’ve enjoyed discussing this amazing British series with him and hearing his insights. Ethan’s creativity extends in many directions. He creates cool memes such as the one pictured above, designs games, plays with technology, surprises me with music that he just casually pulls together on his iPad. He likes to read, watch movies, and play trivia games. He’s a deep thinker. And he’s an outside of the box thinker. His intellect, versatility and keen insight will indeed take him far in life and abroad in the world. 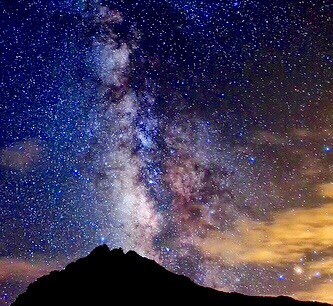 And perhaps this amazing boy with his big ideas will go way, way beyond this world and explore among the stars, literally seeking out new life and new civilizations, going where few have gone before. 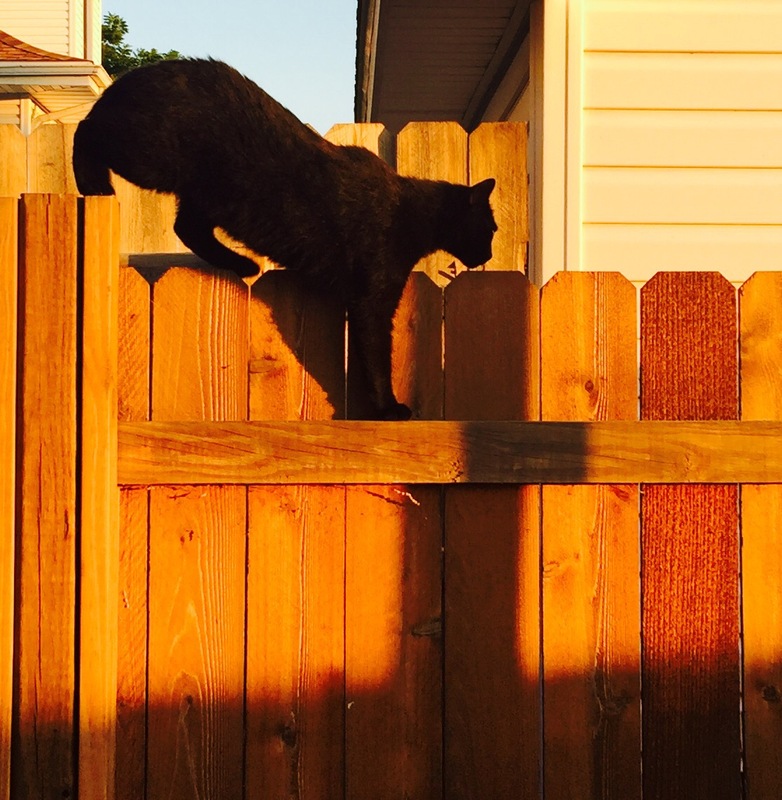 He can do whatever he wants to do. No matter what career or path he chooses, I’ll be here cheering him on. Happy birthday Ethan! I love you! Today I am celebrating the birthday of another family member, my daughter-in-law Megan. 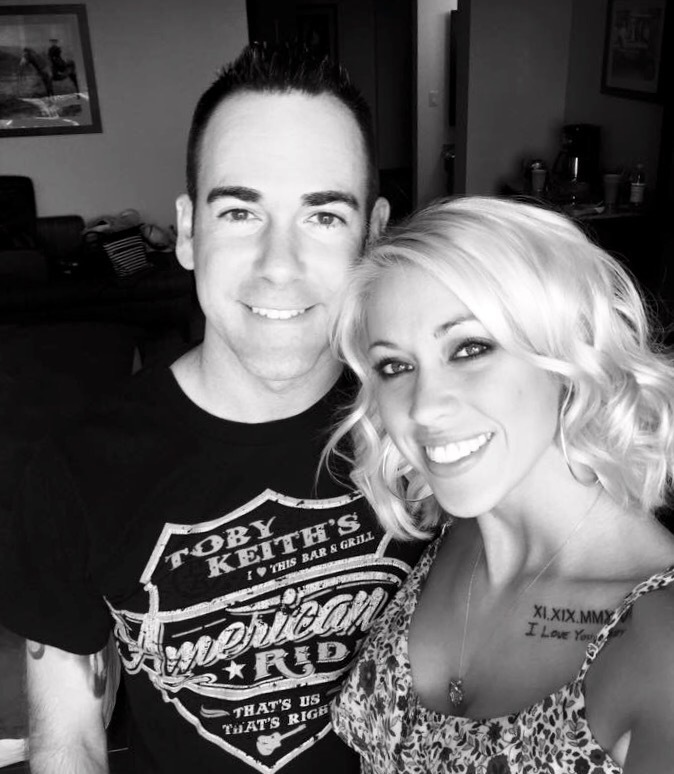 Married to my son Nate, Megan has been a wonderful addition to the family. 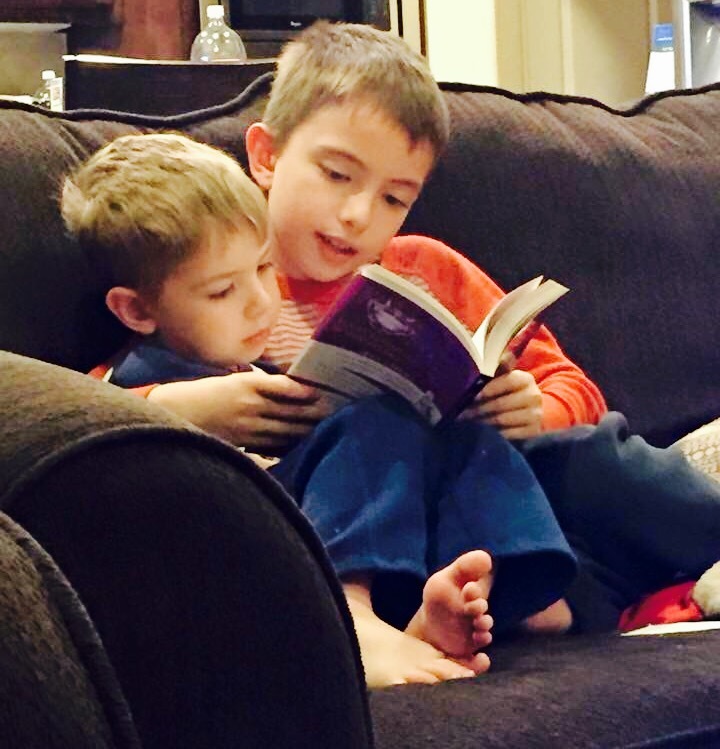 With their marriage, I not only gained a daughter, I gained two grandsons as well. 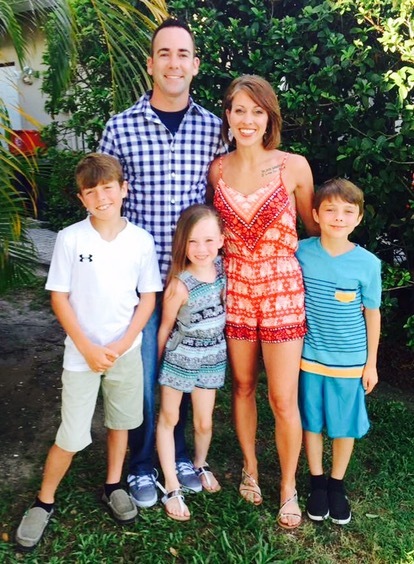 The two blended their families, Nate’s daughter Aubrey and Megan’s sons Joey and Oliver, into a big, fun-loving group. Megan, you care for others with joy. You have a receptive nature and tend to carry burdens for others. You are pragmatic, thorough, strong-willed, practical and stubborn at times. You are hard working, and often a martyr to duty. You appreciate home and security above all and you live an eventful, exciting life. You are versatile and have the ability to learn easily. Dependable, very down-to-earth and well grounded, you are always looking for meaningful work, a career where you can take pride in your work and do the best job that you are capable of. Your prime desire is to build a protected and secure environment at home and at work. You can be very good at achieving goals and gaining objectives. You are very detailed and possess great organizational skills. Your practical approach to life and productivity makes you a beneficial member of the community. Those words describe Megan well. 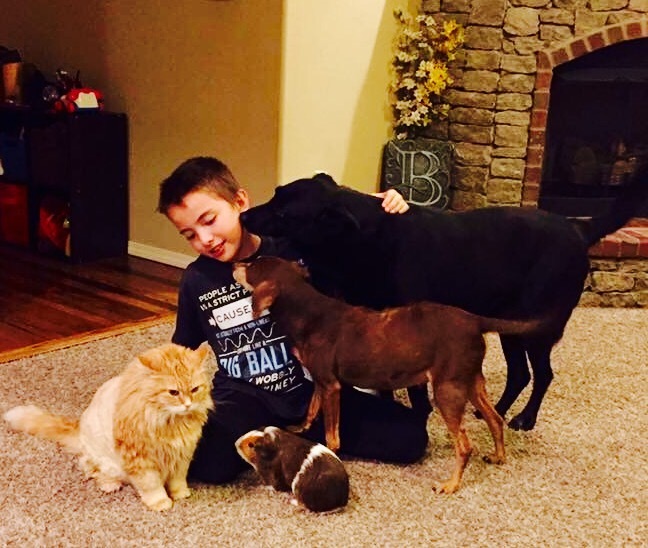 She cares for others, often going that extra mile to benefit clients, family and friends. 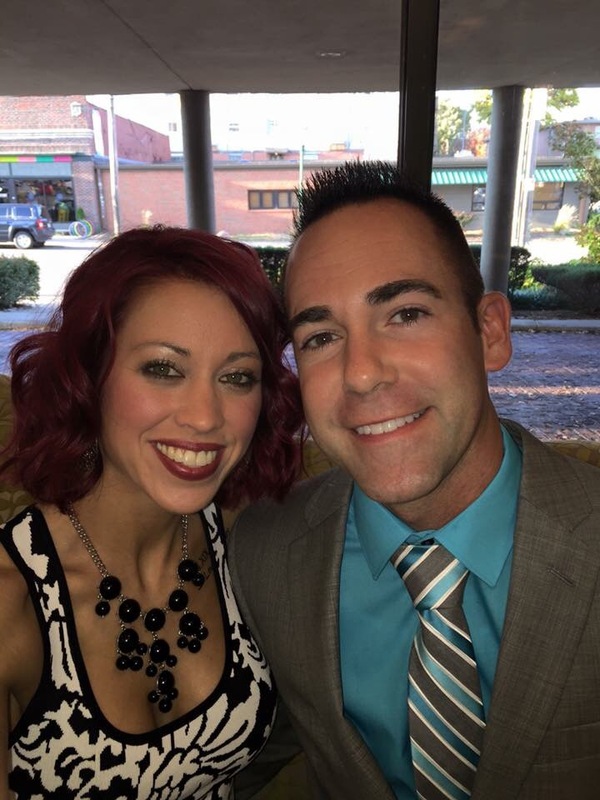 Organized, hard working, practical and dependable are all traits that Megan displays. 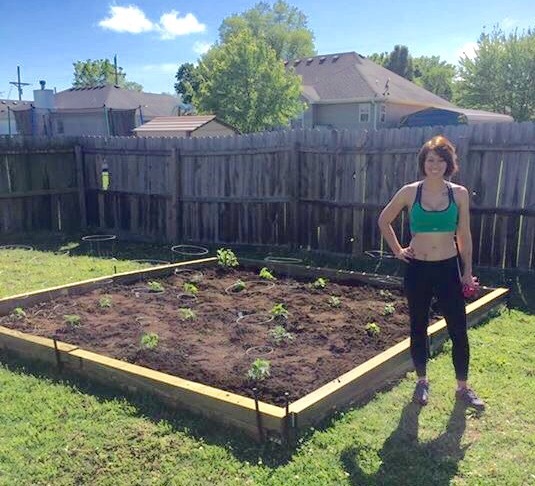 She gardens, she cooks, she cuts hair for family and friends. She’s the kind of person that people turn to, for help, for advice, for a hug and a shoulder to cry on. She’s not all work though. She knows how to have fun and she enjoys outings with her family, date nights with her hubby and time with her girlfriends. Megan and Nate attend concerts together, gather up a group for a night at the drive-in theater, and take the kids on fun vacations. 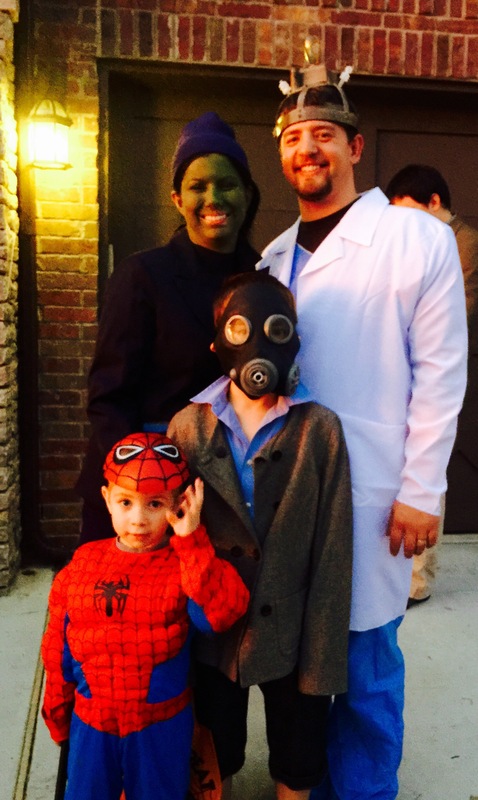 They are very present in the lives of their kids, attending sporting events and award ceremonies. I appreciate Megan’s love and support for my son, and for the kids. She’s an excellent wife and mom, demonstrating kindness and affection, and offering encouragement with a “you can do this” attitude. She lets the kids be kids, knowing they will grow up soon enough. 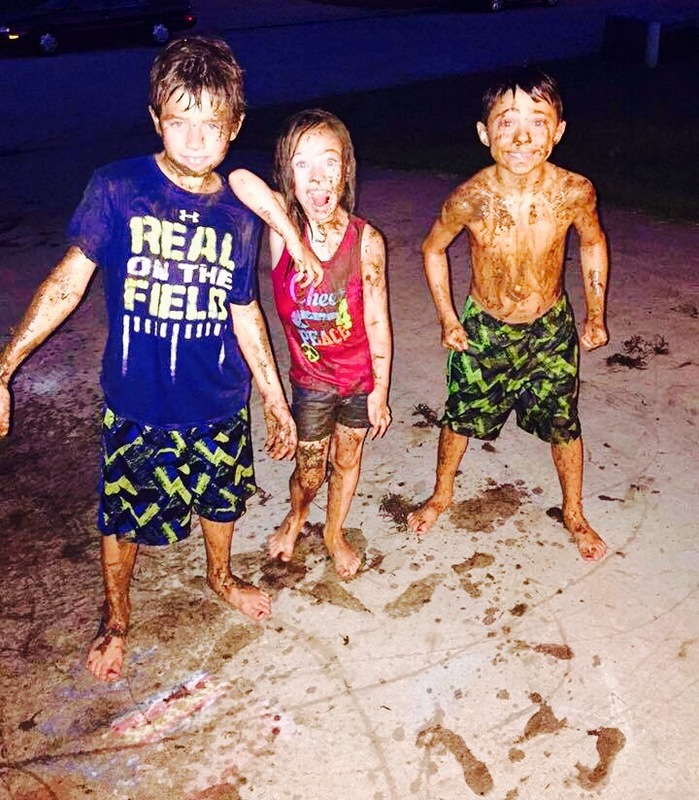 If they get dirty, they will wash! And I appreciate Megan because she is her own person and she likes who she is. 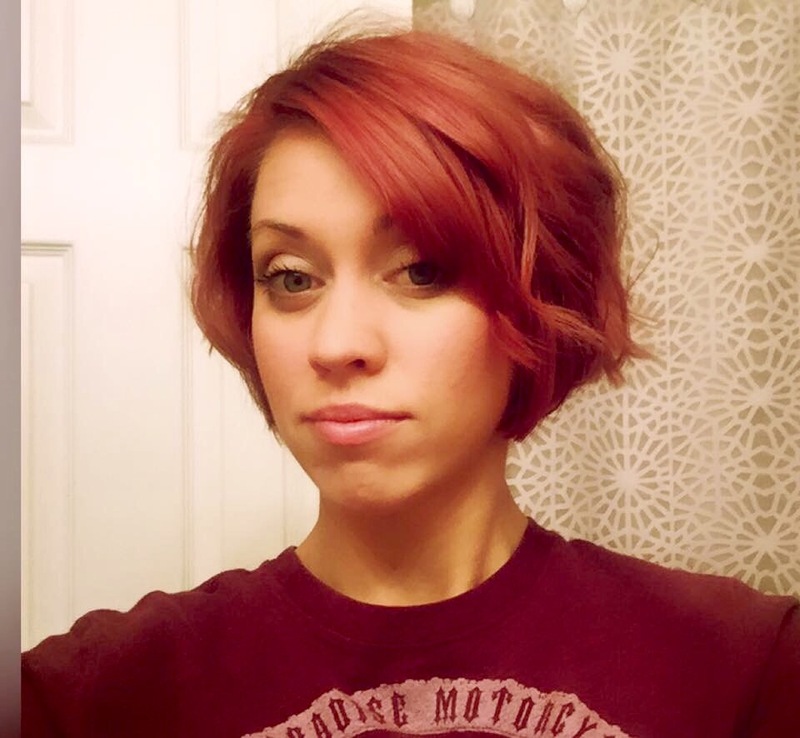 She is versatile, unafraid of trying different things whether it’s a fresh haircut and color, or a new recipe. Life is never boring with this girl. 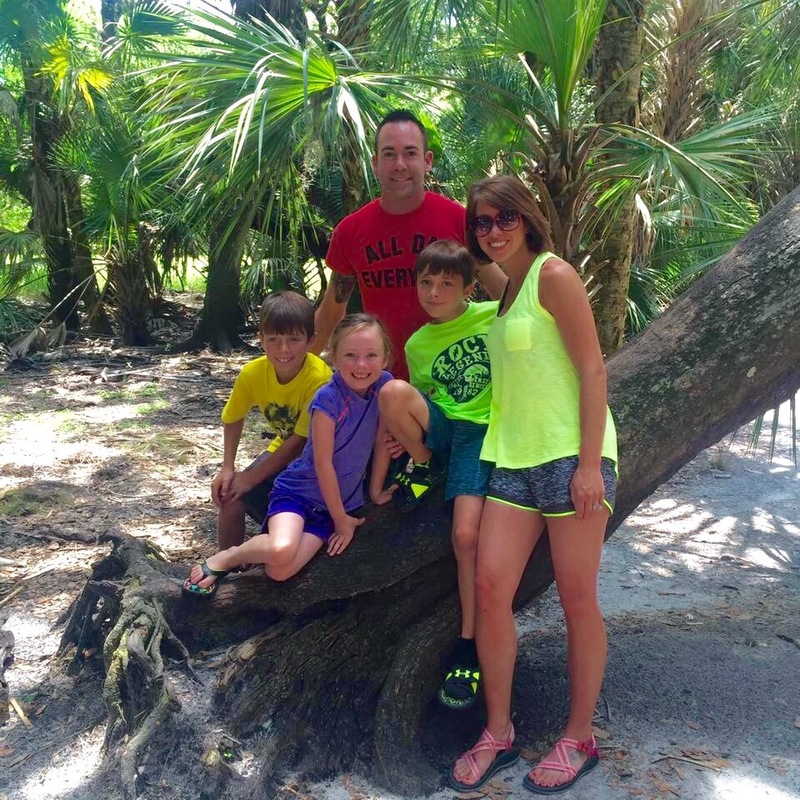 What a great way to model life for her kids, teaching them by example to experience new things and to live with joy. I’m so grateful she came into our family. Happy birthday Megan! I love you. I’ll be sharing a brief blog post tonight, after a lovely evening hosting my book club ladies in the backyard garden. Knowing this event was coming up, I made sure the garden looked its best, putting down fresh mulch and tidying up the beds. My creative activities have aligned perfectly with having guests in the garden tonight. I’ve consistently drawn the gardening activities the last few days. 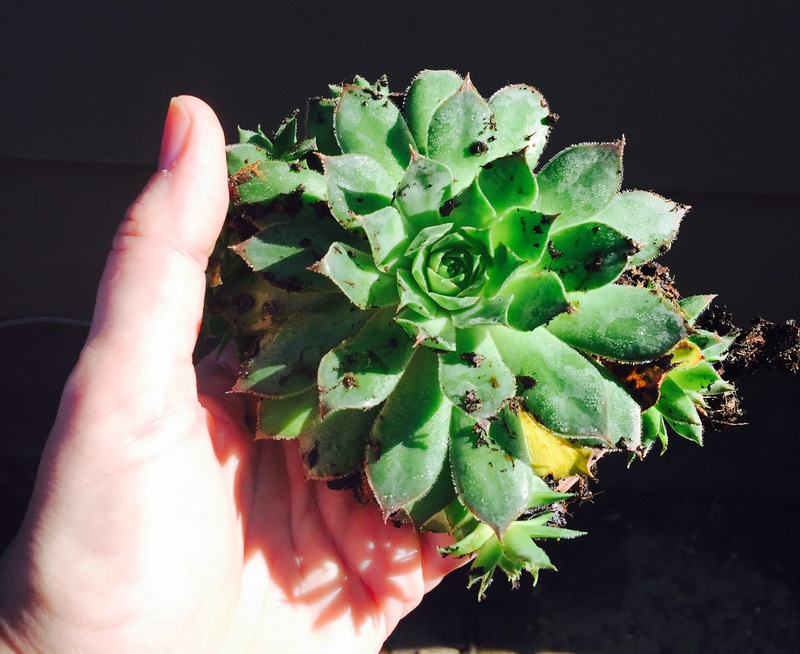 Early this morning, eager to finish up gardening tasks, I was busily planting succulents called Hens and Chicks in and among the Arkansas rocks with holes or depressions in them. Suddenly I paused, realizing I had forgotten to draw my creative action for the day. Dusting off my hands I took the time to correct my goof. There were five folded slips of paper in the pitcher. One of them had for its creative activity the planting of Hens and Chicks in the rocks. Would I draw it? There was a twenty percent chance that I would…and an eighty percent chance that I would not. Plant Hens & Chicks in rocks. True story. I laughed. And I felt relieved. I was already engaged in the perfect creative activity for the day. And more than that, I was shown, once again, that I’m in alignment with the flow of life, with the Divine. I tucked these fun plants into the rocks Greg brought home from his parents’ house. 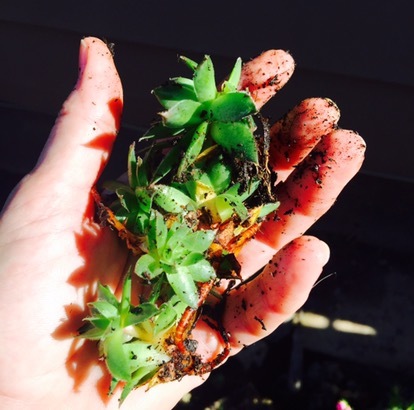 The parent plant, the Hen, creates tiny versions of itself, the Chicks. 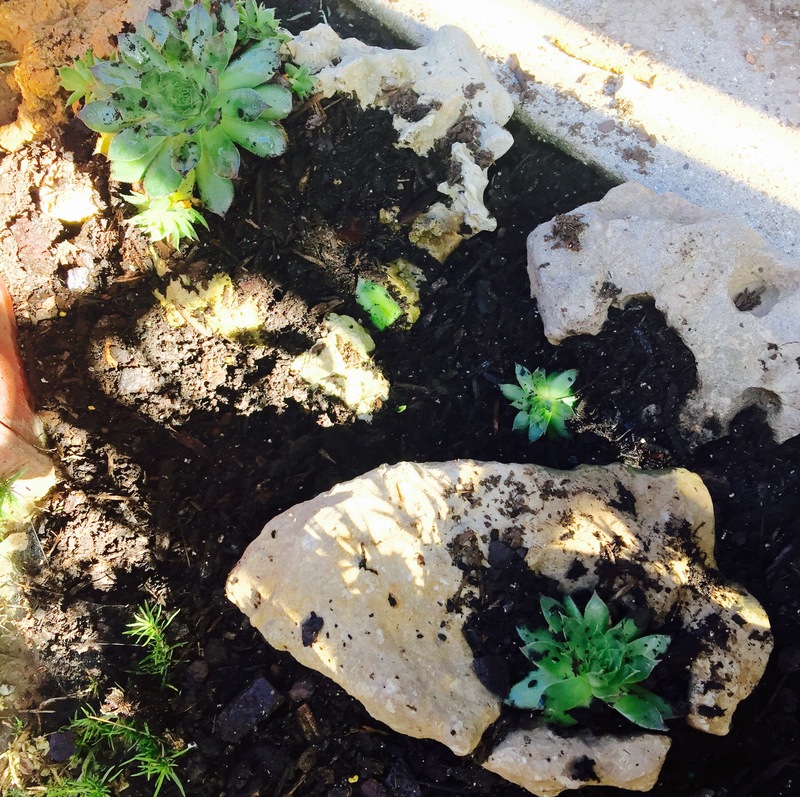 I separated baby plants and scattered them among the rocks. I’m looking forward to watching them grow and spread. I am so humbled by this whole creative experience. I’ve learned more about trust and playfulness and about being surrendered to the flow. And even when I think I’m running ahead, I discover I’m exactly where I’m supposed to be. I am so loving this journey. I anticipated working in the garden today. Partly cloudy skies and lower temperatures created the ideal conditions for such an endeavor. However, I was open to receiving the perfect creative activity, whether it was focused on gardening or one of the three remaining non-gardening actions. 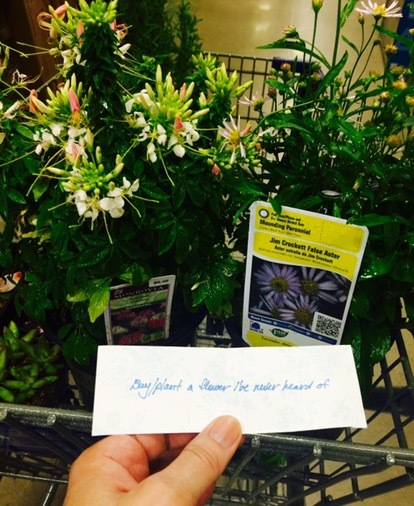 Buy/plant a flower I’ve never heard of. Yes! I was intending to go to the garden center this afternoon to pick up a few plants. This was, indeed, the perfect activity for today. 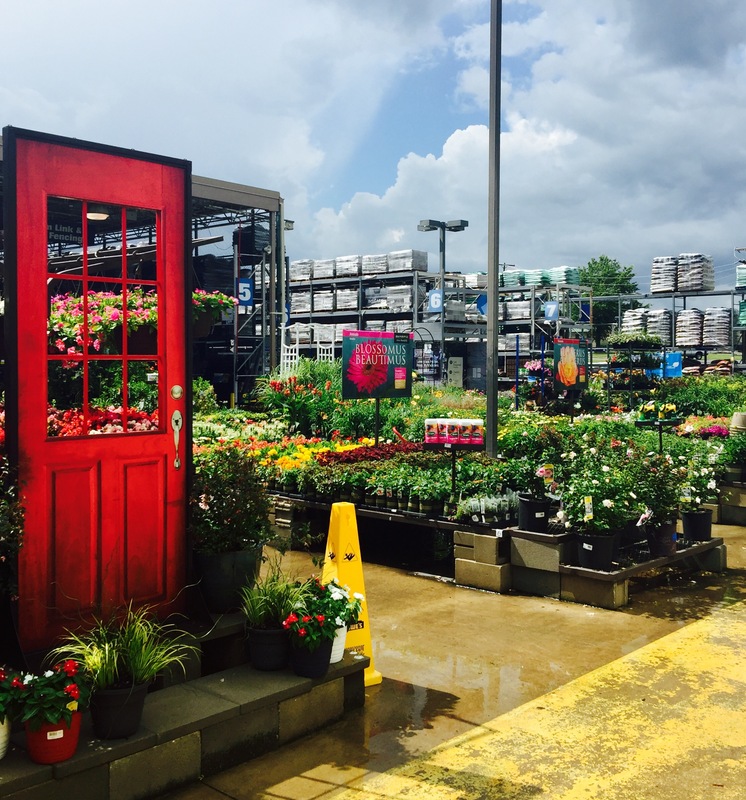 Just as I arrived at Lowe’s Garden Shop, the dark clouds that had been piling up unburdened themselves…with great delight it seemed. I sat in the car, waiting for the torrential rain to spend itself. I felt like I was underwater, peering out through the window into a gray sea. In a few minutes the downpour became a gentle rain. The sun peeked out again, while I strolled around one of my happy places. So many vibrant plants grouped together have a strong, positive effect on me. 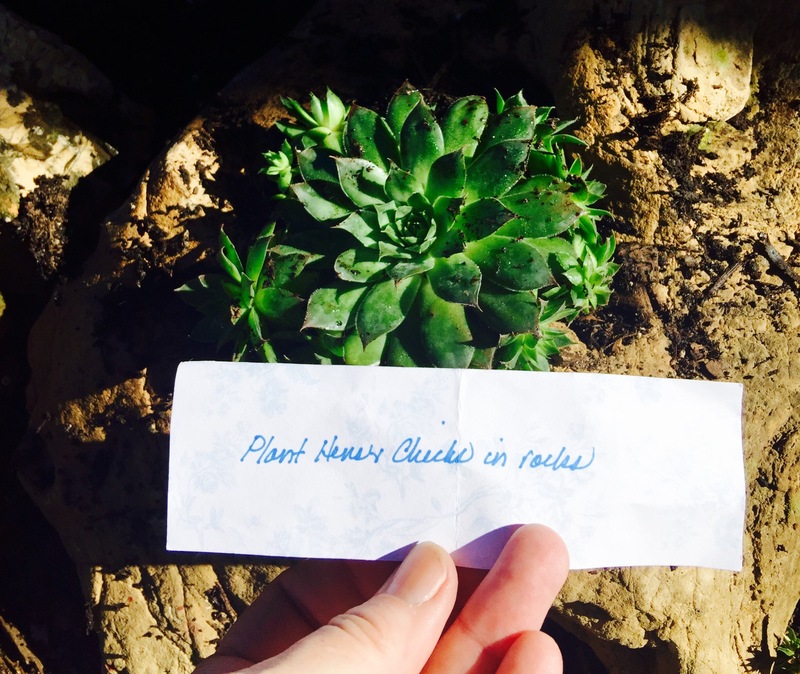 I was smiling and humming as I searched for a plant that was new to me. This proved a bit more difficult than I thought it would. But at last, an unfamiliar flowering plant caught my eye. 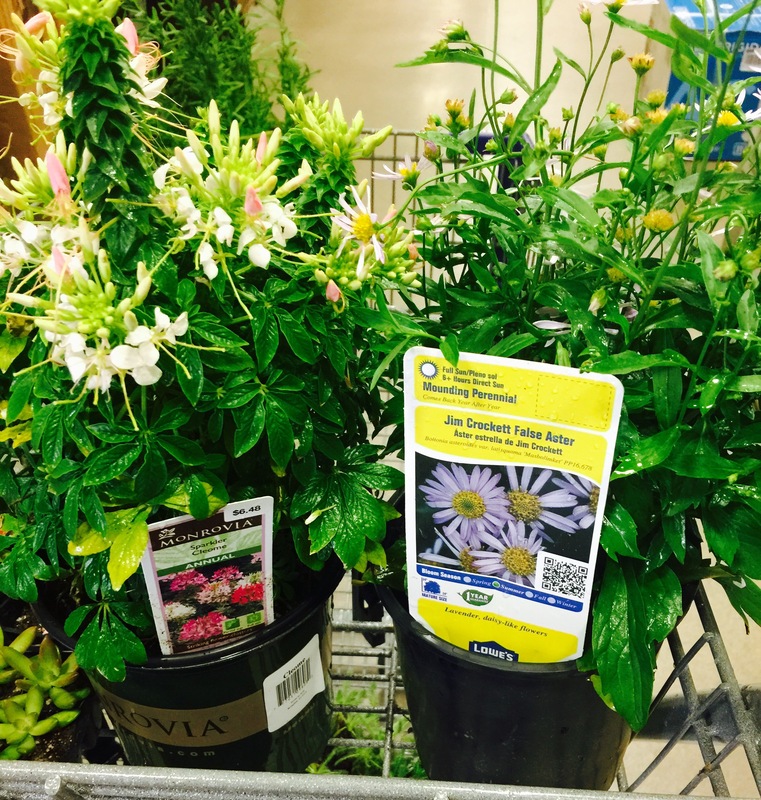 The Sparkler Cleome, pictured above on the left, is a fun flower! It has colorful clusters on a dense shrub like plant. 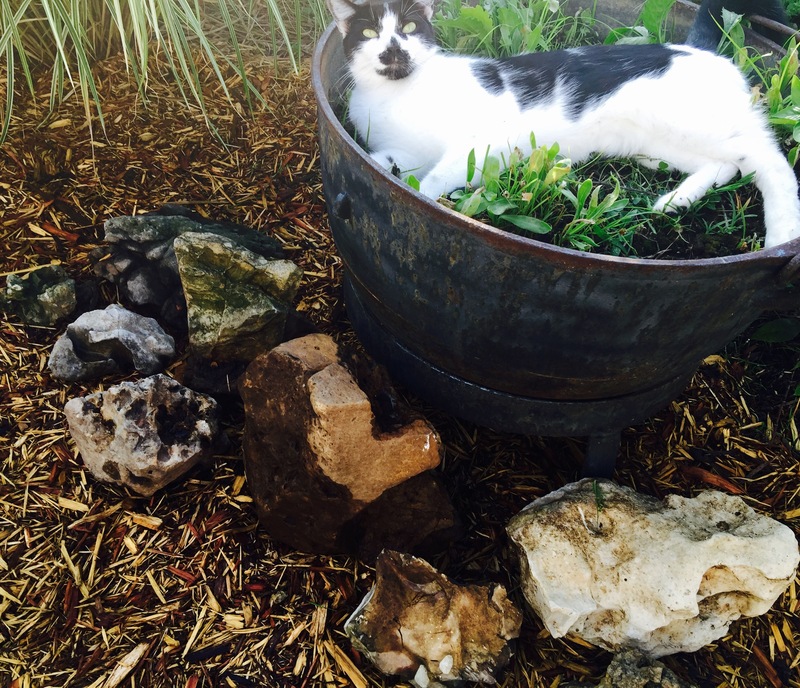 As I picked up a few other plants, I noticed a subtle pleasant scent wafting from the plant. I liked this little beauty. 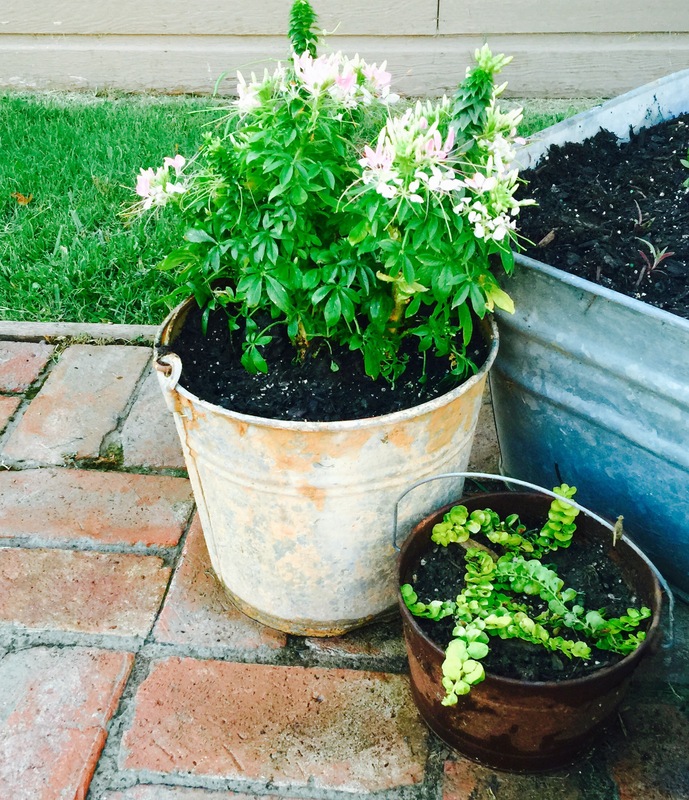 At home I tucked my new flower into a vintage bucket, replacing spring annuals that were done for the season. The Sparkler Cleome is near a washtub full of baby Fireworks Flowers that I started from my own harvested seeds. It seems like the perfect pairing. 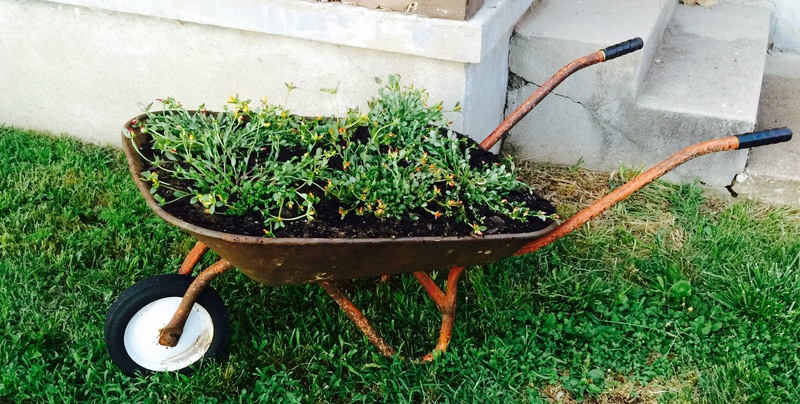 Although not part of my creative action, I tucked portulaca into a rusty wheelbarrow that I salvaged from the Arkansas house. I love using these vintage pieces in my garden. This portulaca is a variety that has large blooms in neon pink, orange and yellow. I can’t wait to see them tomorrow after the blossoms open for the day. Best of all, I can wheel the plants around the yard, trying out different locations. I enjoyed my time in the garden. This space never fails to bring deep peace and joy to me. I am surrounded by beauty here. And today, I introduced a couple of fun fresh elements into my paradise. The garden is ever changing, growing and resting, surprising me with unexpected plants that pop up in new places. I learn so much about myself and my own journey out there. What an amazing classroom the garden is, in which to learn about life. I’ve been looking forward to drawing today’s creative action. Sunday was the perfect day for some concentrated effort on behalf of one of my dreams, as it is my me time, my heart, soul, mind and body care day. 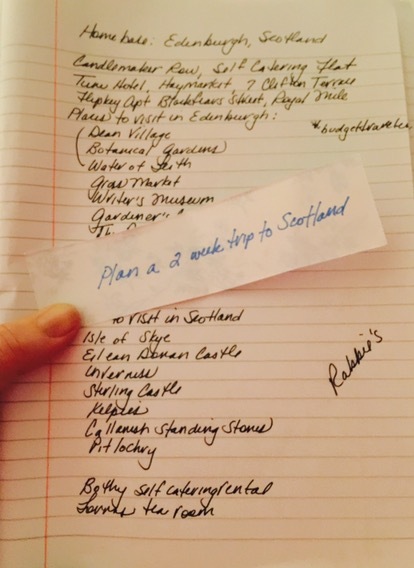 Plan a 2 week trip to Scotland. 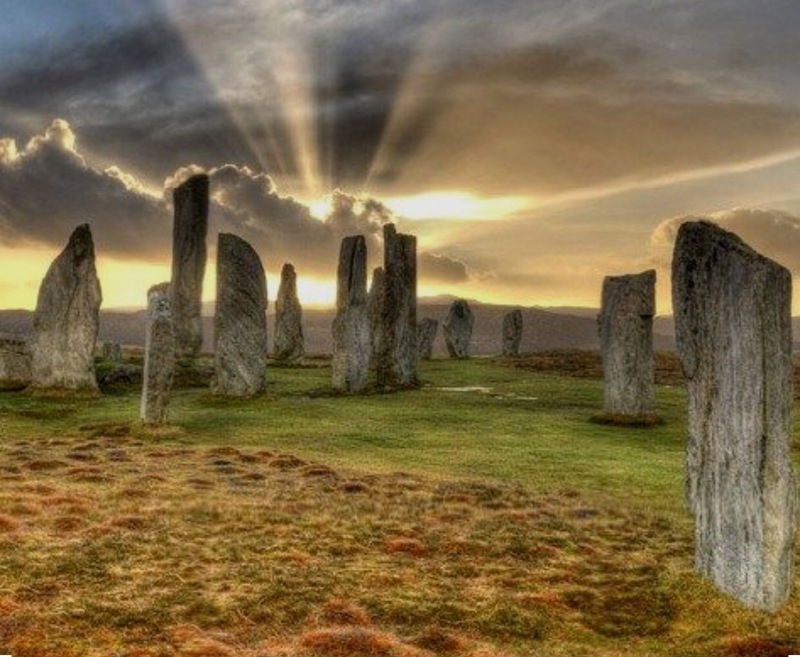 I visited Scotland for the first time in August 2014. I loved the ten days that I spent there with my cousins, Mindy and William, exploring Glasgow, Edinburgh, the Highlands and our ancestral village Lauder, in the Borders. Even though I had never been in that beautiful country before, I felt like I came home. I cherished every moment, and as soon as our plane lifted into the air from Edinburgh Airport, I began thinking about going back. What fun then this afternoon, after a morning spent in the garden, to do more than just think about my return trip to Scotland. I spent several hours planning my trip. Ten days was a great start in getting to know the land of my ancestors. We’ve been properly introduced, Scotland and I. Now I want to learn more, and deepen the connection. I want to see places that there just wasn’t time for on my first trip. 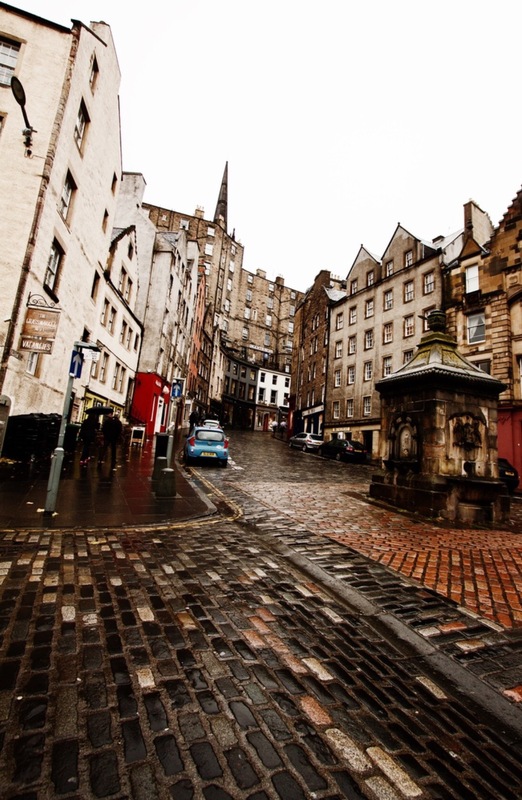 Edinburgh will be my home base on this second trip. 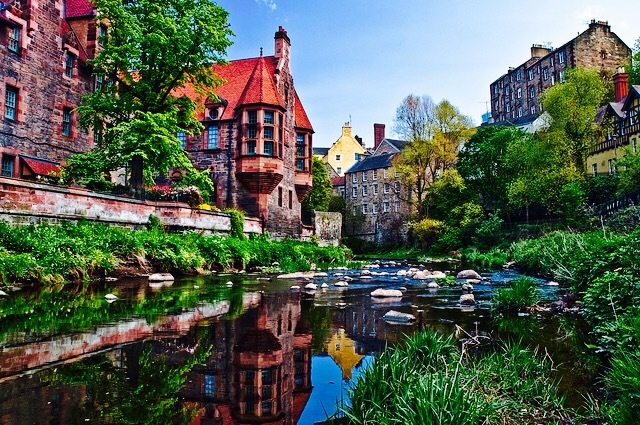 Scotland is a small enough country that I can take day trips to anywhere from this centrally located city. And I do love Edinburgh. Although I expected to be drawn to the Borders, where my clan resides, it was this ancient city with the fortified castle perched high above it that captivated me. I have never had such a strong attraction to any other location. I am haunted by Edinburgh. The first item on my planning list was locating budget friendly extended stay facilities in the heart of the city. 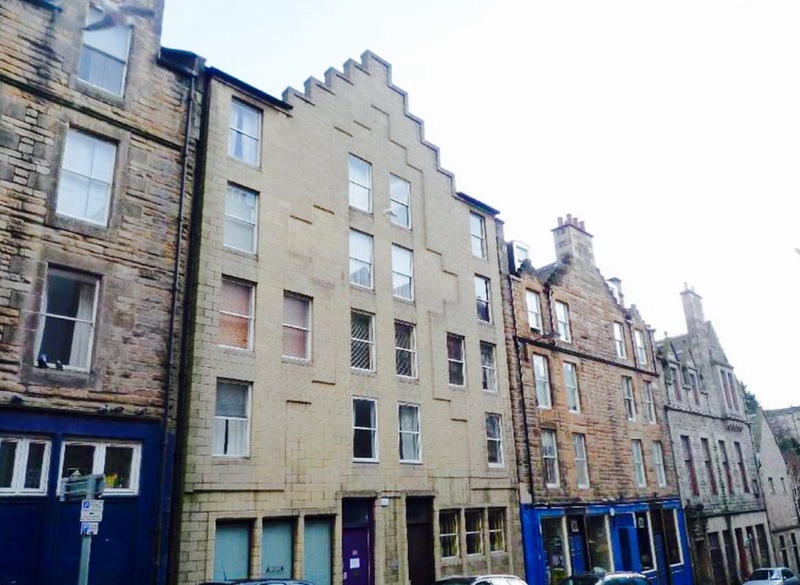 My favorite find was a self catering apartment on Blackfriars Street, just off the Royal Mile, that leases for a week at a time. It is perfect for my needs. Places on my itinerary that I missed before include the Writer’s Museum, pictured above, the Royal Botanical Gardens, The Elephant House (the pub where JK Rowling wrote much of Harry Potter), and Dean’s Village, pictured below. 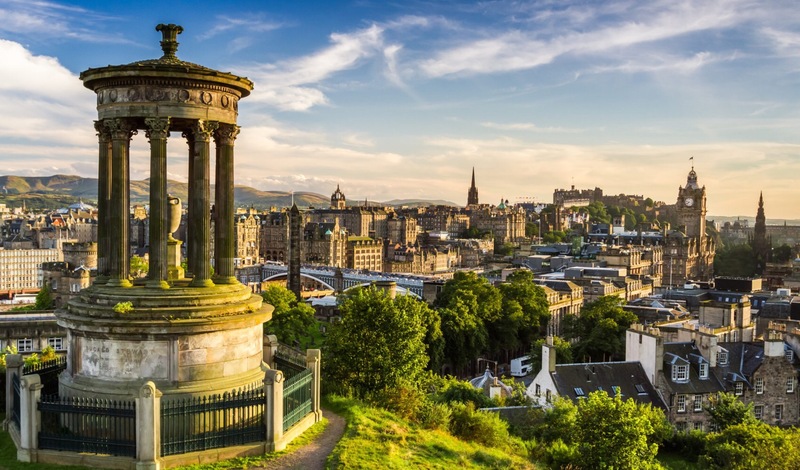 I intend to have afternoon tea at The Palm Court at Balmoral Hotel, stroll through the Princes Street Gardens and enjoy fine Scottish fare at The Gardener’s Cottage and the Scran and Scallie Public House. 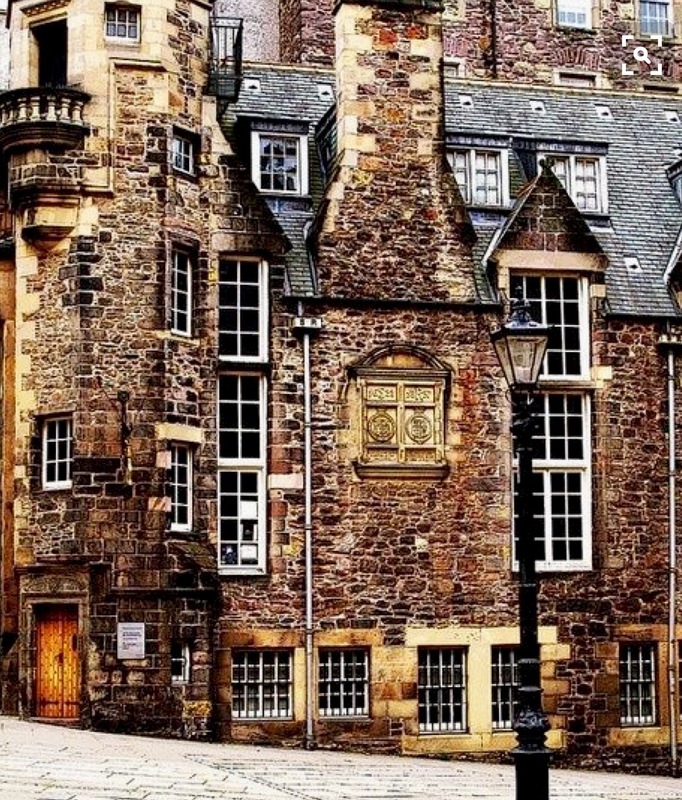 And I’ll revisit favorite sites such as Edinburgh Castle, and walk the Royal Mile. 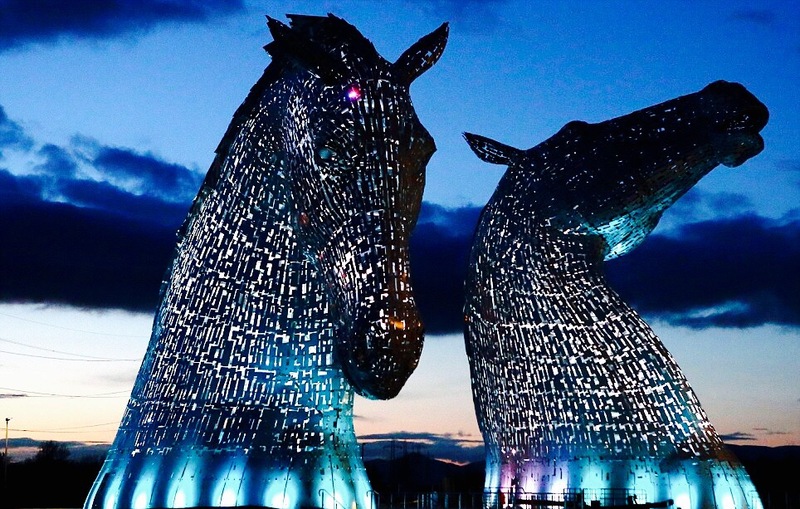 During my day trips, which could occasionally turn into overnight visits, I’ll see the huge, magnificent Kelpies for the first time, shown in their glory above, go off the mainland to the Isle of Skye, and dance among the mysterious Callanish Standing Stones. 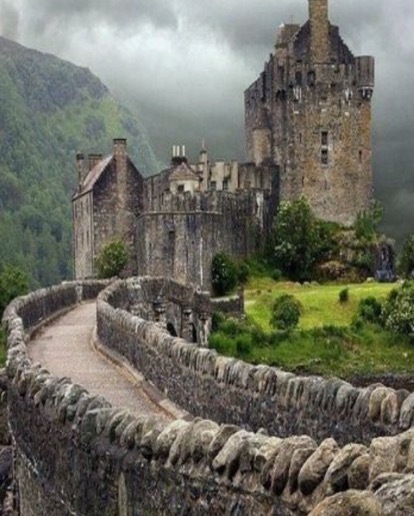 Sterling and Eilan Donan Castles are on my must see list, as are the towns of Inverness and Pitlochry. And I will venture into the Borders again. I look forward to another long, leisurely tour of Thirlestane Castle, eager to see how the renovations are going. 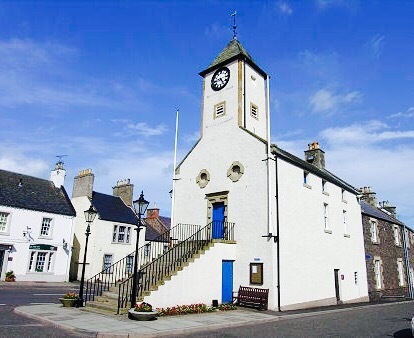 And I know we missed parts of the quaint village of Lauder. I intend to see it all. I loved planning my trip today. To move from longing to go back to making detailed plans brought me great joy. Putting actions with my thoughts sends out a strong signal that I’m making ready. I know that the Divine comes to meet me as I move forward, arranging everything once I release the outcome and settle into the flow of life while staying open. As I looked up information and scribbled notes this afternoon, I heard in my heart these whispered words, “Get really specific with your desires…” I was ever so happy to comply. As this month of creative activities is winding down, I realized this morning that all of my actions that involve working in the garden remained in the pitcher. It would appear that I’m going to be spending some extended time in my backyard paradise. Arrange AR rocks in garden. 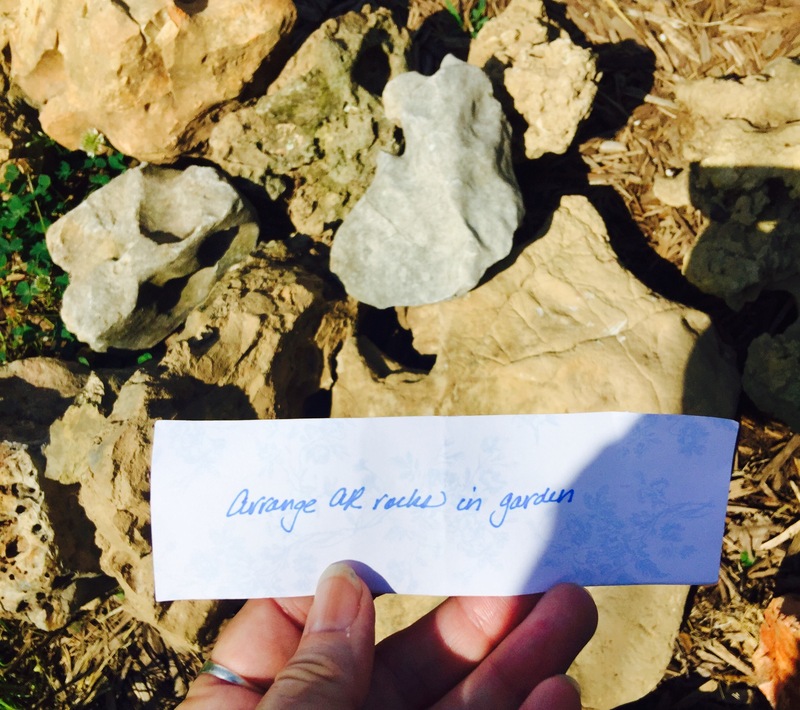 Before Greg’s parents’ house closed in Arkansas, he transported a variety of rocks from that property to the backyard garden. It wasn’t because Arkansas has rocks and Missouri doesn’t! 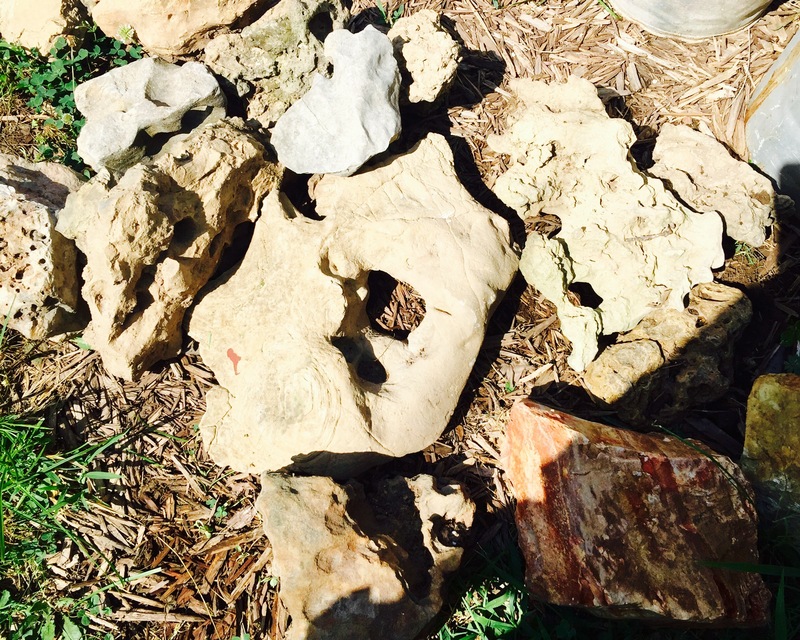 These rocks were collected over the years by Greg’s sweet mama. In the midst of a fishing trip on the lake, she would suddenly spy an interesting rock, and guide her patient husband to shore, to collect the treasure. The rocks have been piled in the backyard, awaiting my attention. 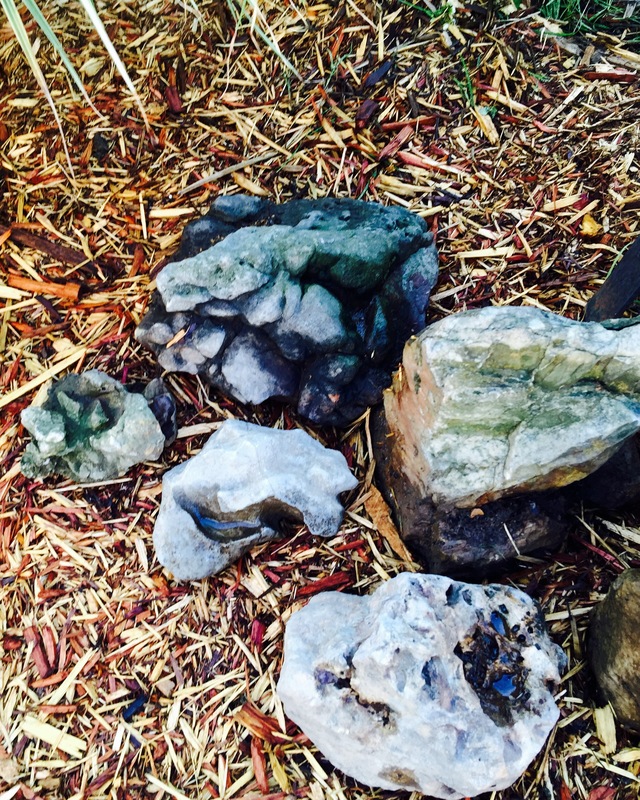 I was happy to begin settling the rocks into the garden this morning. Those with holes or deep reservoirs in them will be grouped together for a special purpose. More about that project when I draw that creative activity! Today I concentrated on the rest of the collection. 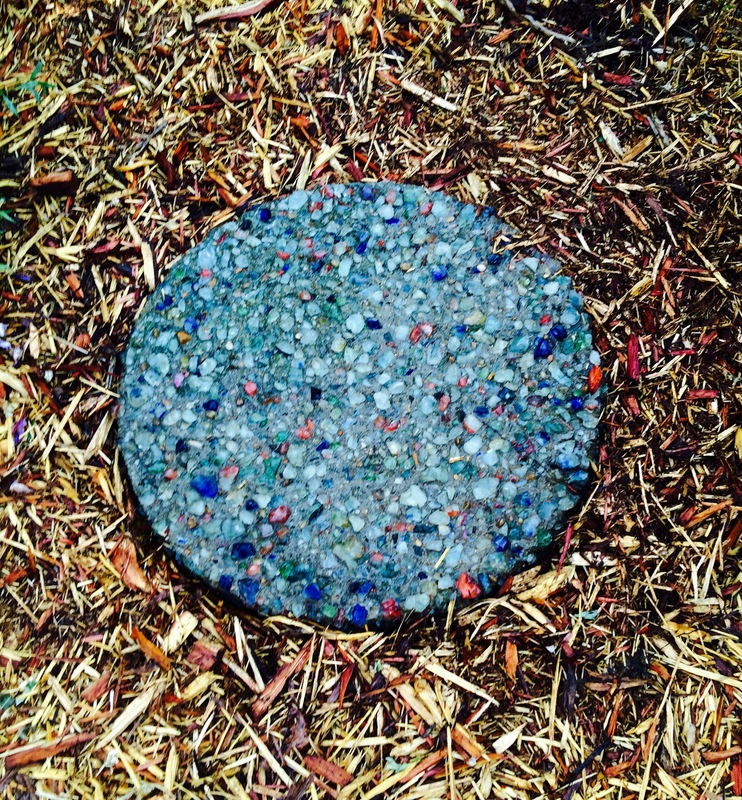 I love that Greg uncovered and brought to Joplin this pretty garden disc, made of colorful rough cut stones. After a thorough cleaning, the disc found a new home at the entrance to my meditation area. 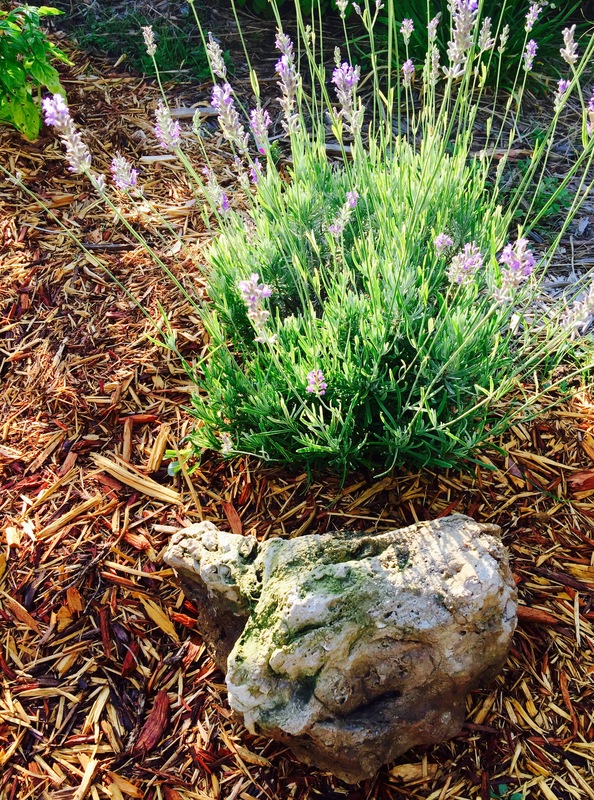 A large, beautifully textured rock with mossy green patches came to rest near clumps of lavender. 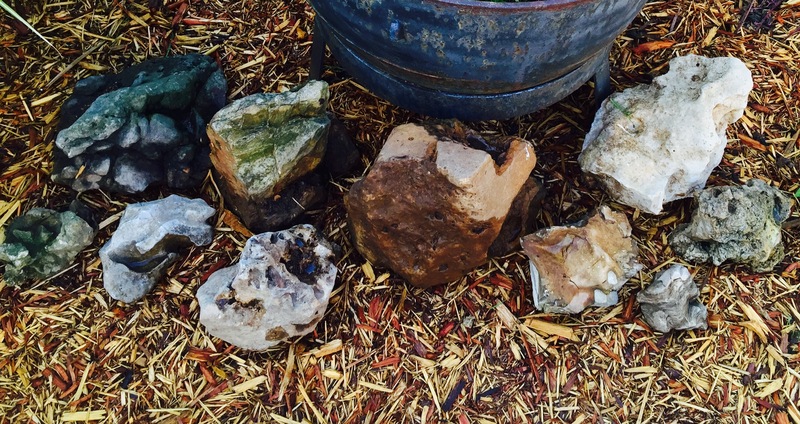 I created a grouping of rocks around the black kettle. Rilynn, who was following me around the garden, photo bombed my picture. I will continue to play with these rocks, trying different combinations of displaying them, until I’m satisfied with the look. The variety of colors, sizes and textures creates interest. As I was working with these rocks, Greg pointed out that we had a visitor. 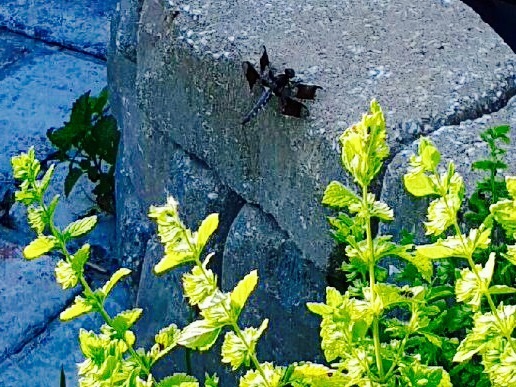 A unique black and white dragonfly was flitting about the garden, circling me, coming to rest occasionally on the fire pit or garden arch. I was delighted! I love dragonflies, and had one as my symbol a couple of years ago. These magical insects represent walking in two worlds and they are always welcome in the garden. The dragonfly’s unexpected appearance caused me to reflect on the nature of rocks. There is interesting symbolism connected to rocks. Because they endure, they represent eternity and solidity. We refer to a loyal steadfast individual as being “solid as a rock” and one of God’s names is Rock of Ages. Our ancient ancestors thought that spirits dwelled within rocks, which is one reason for using them as headstones in cemeteries. Or rocks were piled as a memorial, a solid reminder that a beloved person once walked this earth. Carl Jung saw the rock as a symbol of eternity as well. He said that each of us has inherited an ancient human tendency that allows us to see and feel the sacredness in rocks. I like that. I like having these weighty symbols in my garden, memorial stones that remind me of Greg’s parents and all those in my family who have transitioned into eternity. There is a sacredness, indeed, that I feel in their presence, a earthy, positive hum of energy that grounds my garden and grounds me as I walk in it. I don’t consider it a coincidence that as I placed these ancient expressions of Divine love around my garden, a dragonfly appeared. He reminded me that this restorative space embodies peace and joy, beauty and enchantment, Earth and Spirit. The rocks called to him. They call to me too. For the first time in a couple of weeks, I woke up to the rumble of thunder and the patter of rain. Heavy rain. 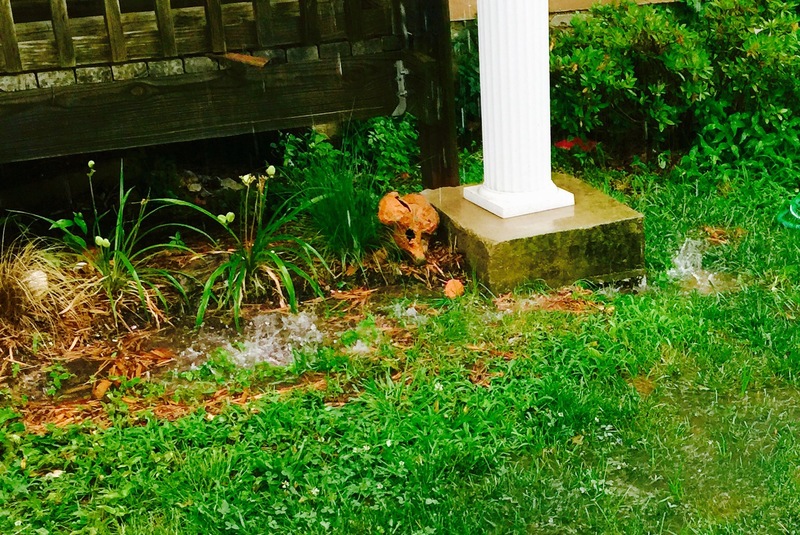 The thunderstorms started last night and continued to roll through the area overnight. I felt a heightened sense of anticipation as I reached into my glass pitcher this morning. There were nine folded slips of paper left. I knew one of them was a rainy day activity. I laughed! How perfect. How beautifully soul expanding, heart lifting, mind blowing perfect. I had a full schedule ahead for the day, beginning with a morning closing. 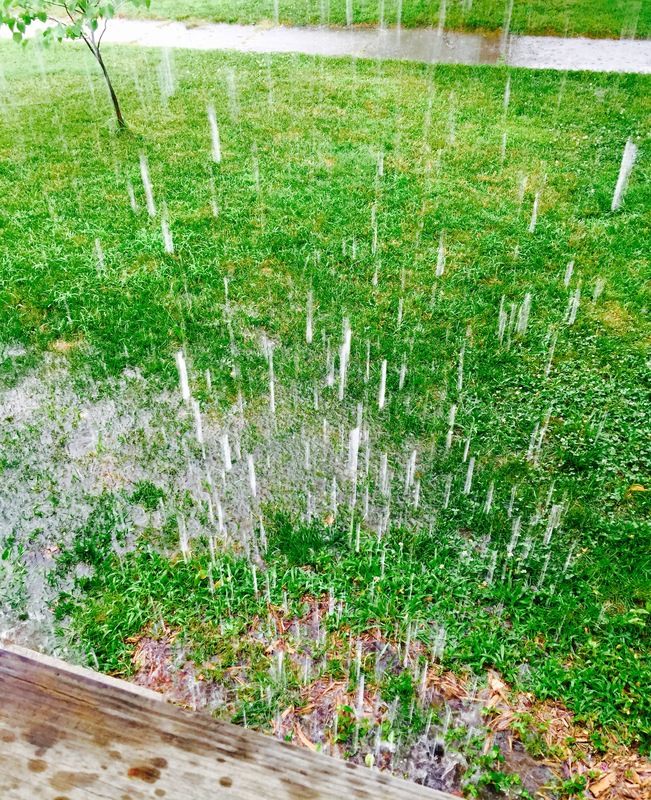 However, I took time to stand on the covered front deck, watching the rain fall down in heavy sheets. The word “deluge” came to mind! I inhaled the fresh earthy scent and grabbed potted plants, holding them out in the rain to receive a drink. Ready to leave for the day, I played in the rain, on my way to the car. Because I didn’t want to walk into my office and then a closing soaking wet, I did something that I rarely do. I flipped open an umbrella. 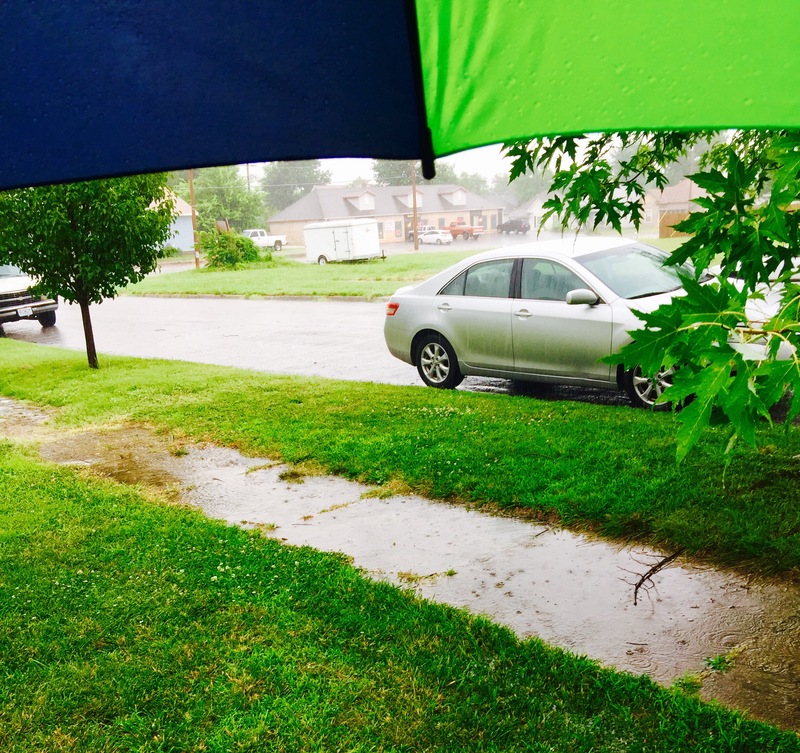 I was instantly transported back to my childhood, when I would walk around in the yard while it rained, splashing in puddles, feeling intimately enclosed in my own little world beneath the umbrella. 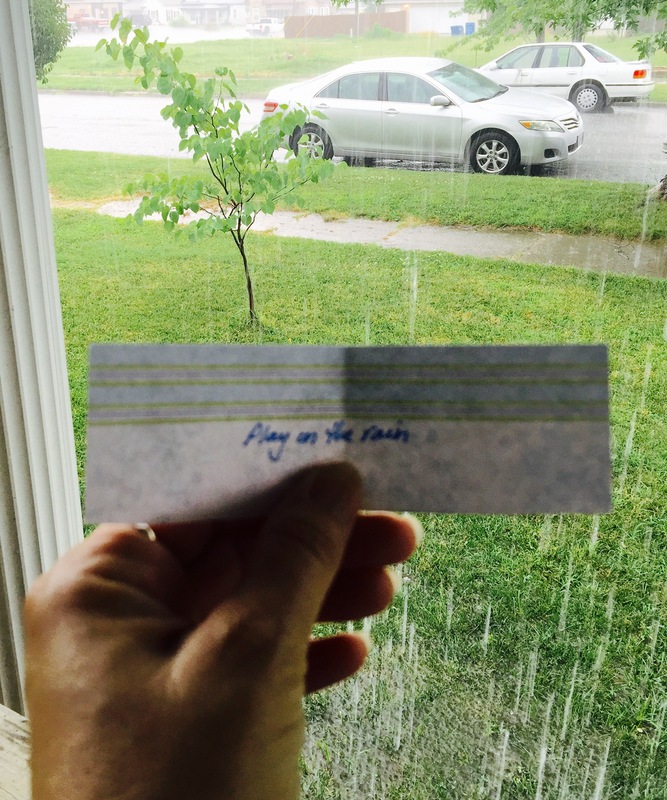 When I wrote this creative action, back in late May, I envisioned carrying out this action by dancing wildly in the rain in the backyard. This was much more sedate play today, but full of joy. 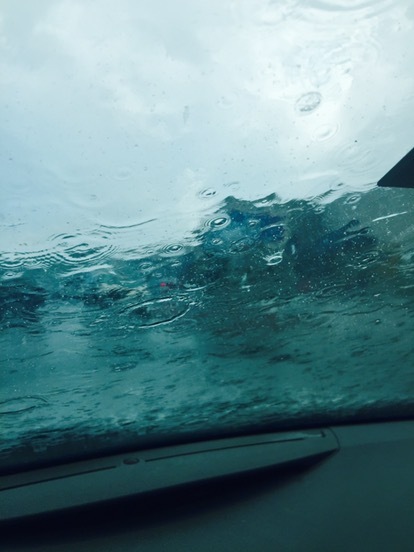 In the car, the playful attitude stayed with me, and I drove through huge puddles of water with gleeful abandon. I am undone by this month of creative actions, these arrows of desire. I am amazed by the synchronicities, and the alignment of the activities with the unfolding of the day. Only two rainy day activities in the batch of 30 and I drew both of them on rainy days, with many days of dry hot weather in between them. Every time I reach into that glass pitcher, it is an act of trust. After 22 days of randomly selecting creative actions that are undeniably right for the day, I have sunk deeply into that trust, deeply into Divine guidance. I am surrendered. This has been an incredible experience that has opened my heart beyond what I could have imagined. I know I am being prepared for something yet to come, just around the river bend. I was happy to draw today’s creative activity, and as I worked through a long, busy day, I stayed open to the outcome. Like most other people, I primarily rely on technology to communicate. It’s so easy to send off a quick text to check in on a friend or family member, respond to a client’s question or even say “Happy Birthday”. It’s been a while since I wrote to someone, using pen and paper. And yet, I recognize how energy flows through the act of writing. Ideas and thoughts literally travel down my arm, from my mind, and appear on paper as my hand moves. It’s magical! And it is becoming a lost art. 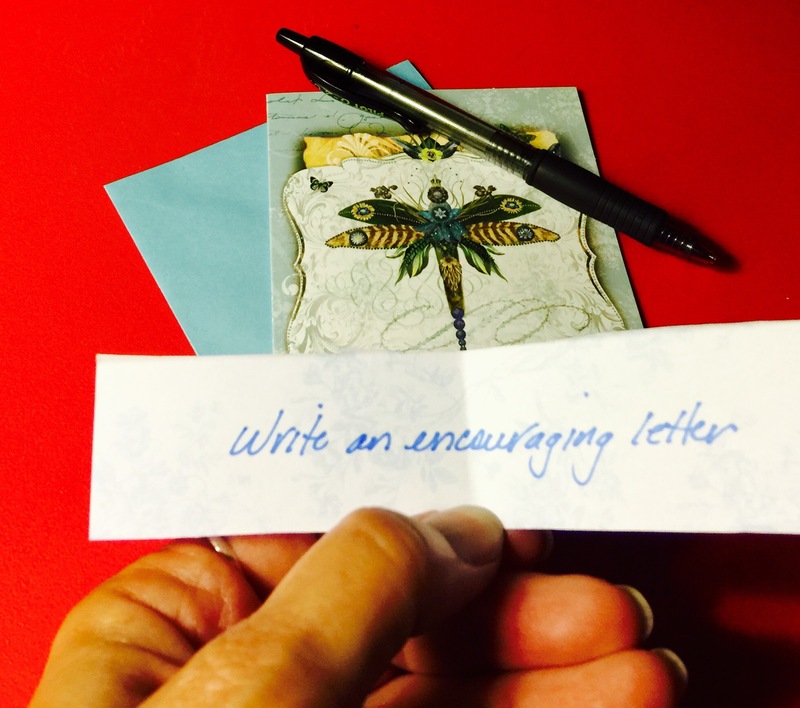 I felt inspired to include this form of communication as a creative action, looking forward to sending words of encouragement, and their accompanying positive energy, to someone special. 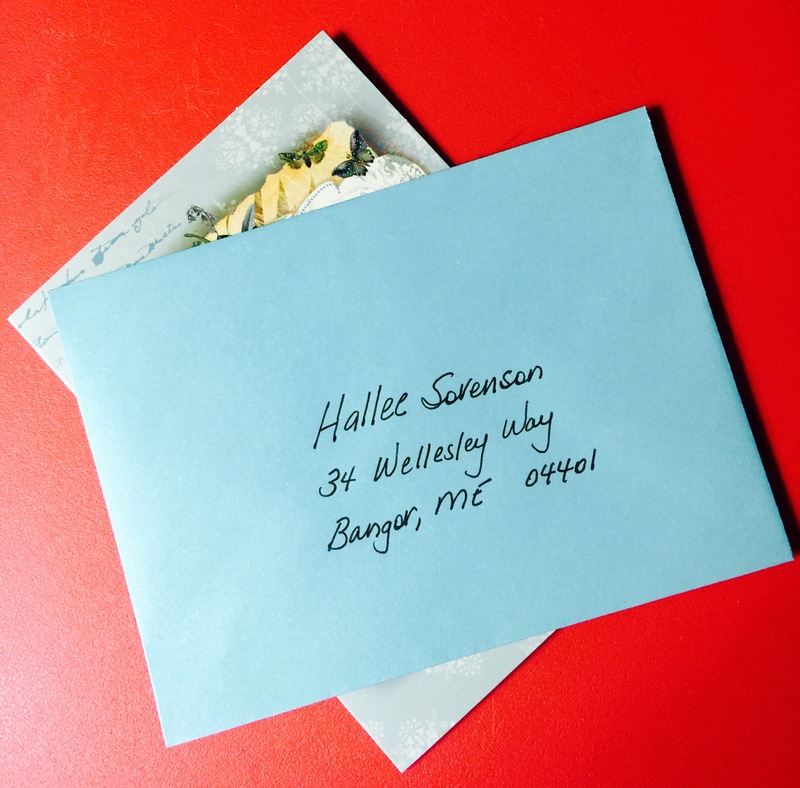 As I settled in at home, I stayed open toward the recipient of my letter. I just didn’t know who it was going to be yet. This is where inspiration…Divine guidance…stepped in. As I was checking Facebook, I remembered a group that I’ve liked. 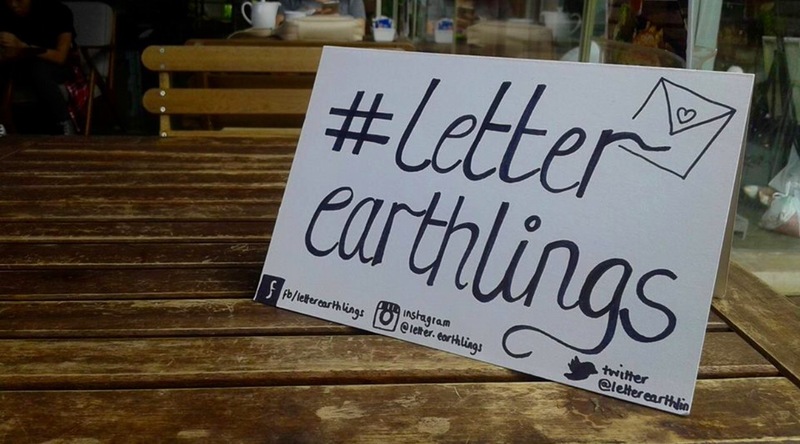 Letter Earthlings believe in “touching lives, one letter at a time.” This organization holds letter writing circles in places such as Singapore, Sri Lanka and India. They bring hope to people, by way of beautifully crafted, hand written letters. This is my cousin Hallee. I’d like to tell you a little bit about her… First off, she is a beautiful young woman-both inside and out. She lights up a room with her smile. Hallee is funny, sweet, caring, smart, an athlete, a jigsaw puzzle champion, a wonderful student, and a best friend to all. Hallee is an amazing person-a person I am proud to be related to. She is also a person who just happens to have Autism. She has never let that small detail define who she is as a person-which is why I refuse to use it as something to describe her. A fun fact is that Hallee’s Birthday is fast approaching! 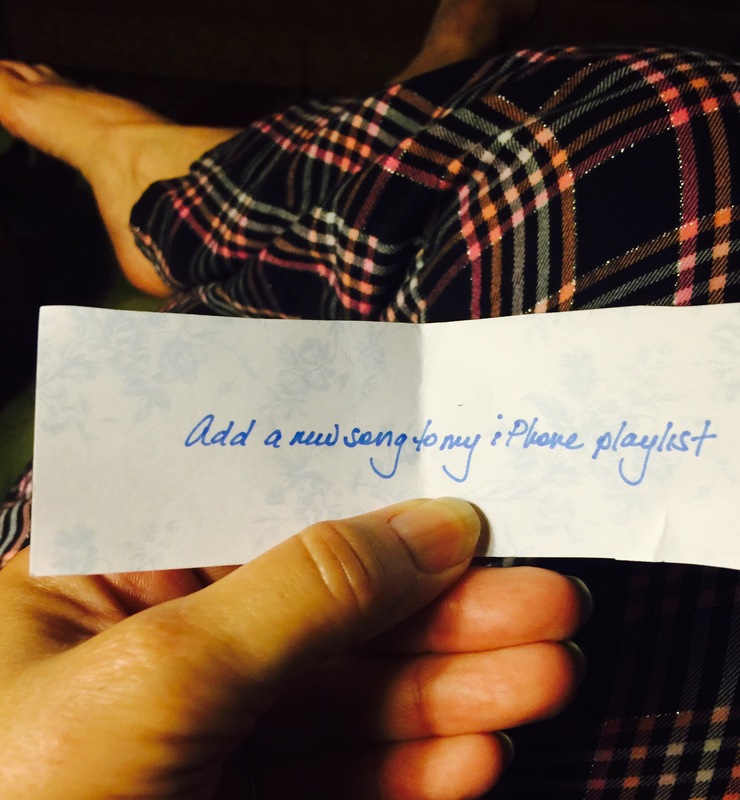 And this is where I have a favor to ask of all of you…. This year we are having a large family party for her. But you can help make this years birthday incredible!! I would love to flood her mailbox with birthday cards, from all over! Hal loves getting mail- this would be the best birthday gift she could ask for. If you could find it in your heart to take a few mins out of your day and send her a card, I would be forever greatful. This would mean a lot to her mother as well, for as you can imagine, watching your child cry into her birthday cake breaks your heart. If there is anyone who deserves a great birthday, this is the girl. Please help us make this birthday memorable. I was so touched by Hallee, and the love her cousin Becky has for her. I knew this was the person I was supposed to write an encouraging letter to. I’m very grateful that I was drawn to the Letter Earthlings site, where I discovered Hallee. And, I still have time to get a card to her by her July 2 birthday. I selected a pretty dragonfly card, in honor of Hallee and her special day, and wrote her a brief, joy filled letter. I know she is receiving encouragement and well wishes from all over the world. My card will be mailed tomorrow. Because it was getting late, I almost picked someone else to write a letter to, even though I didn’t feel like it was the right recipient. I love these little taps on the shoulder that creative inspiration gives, the invitations to “come this way”. May I continue to stay open and receptive to such beautiful guidance. I love the creativity that’s linked with cooking. I so admire chefs and people who just “whip something up” in the kitchen. I’m an okay cook, but nothing amazing. Yet I seem to be drawn to this form of creative expression. This was especially serendipitous because late this afternoon, in between my last two appointments for the day, I visited Robertson Family Farm, south of Joplin, with my mom and sister, Linda. 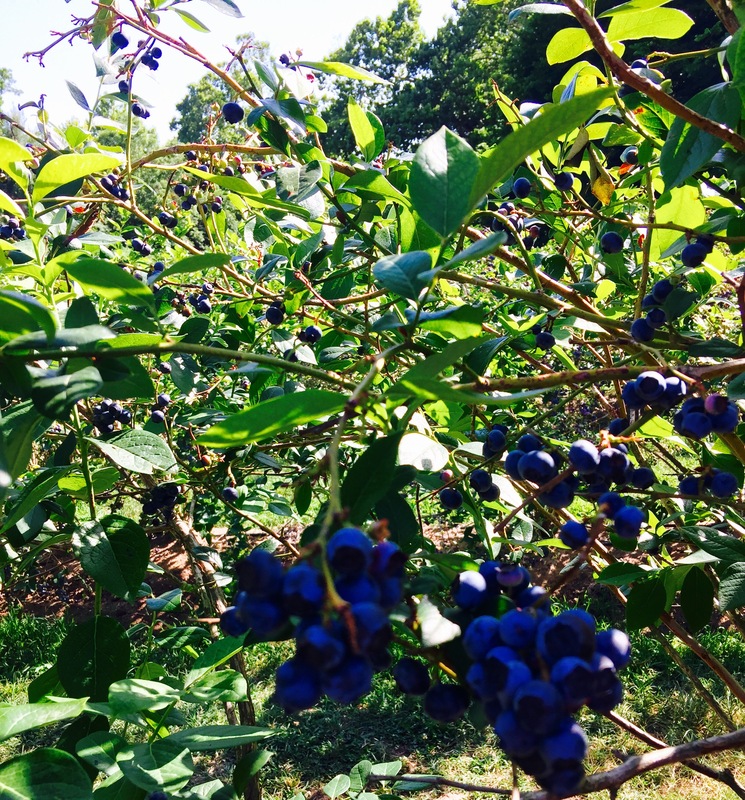 Grabbing buckets, we moved together in between rows of bushes, picking luscious ripe blueberries. Back home with three pounds of blueberries, I knew I wanted to create a dessert using these delicious berries. Tonight I assembled ingredients in the kitchen, realizing what I was really doing was creating a dish without using a recipe. 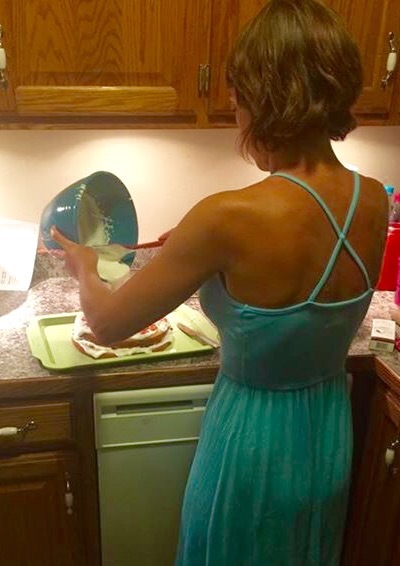 I used to love standing next to one of my grandmothers, an oversized apron wrapped around me, watching as she cooked. I don’t know if I ever saw Granny Grace or Grandma Mildred use a recipe. I’m sure as young brides they must have. However both were seasoned cooks by the time I was old enough to pull up a chair to stand on as I watched them create their magic. They threw in a cup of this, a spoonful of that and a pinch of salt, or some aromatic spice, and the results were always wonderful. I, on the other hand, have always relied on cookbooks. Or more recently Google to pull up an online recipe for any dish imaginable. Other than recipes I’ve memorized through repetition, I haven’t had the confidence to throw a little of this and that into a bowl to get a delicious result. Tonight, I was determined to create, without a net…no recipe in sight, no Google search to save me. How hard could it be? 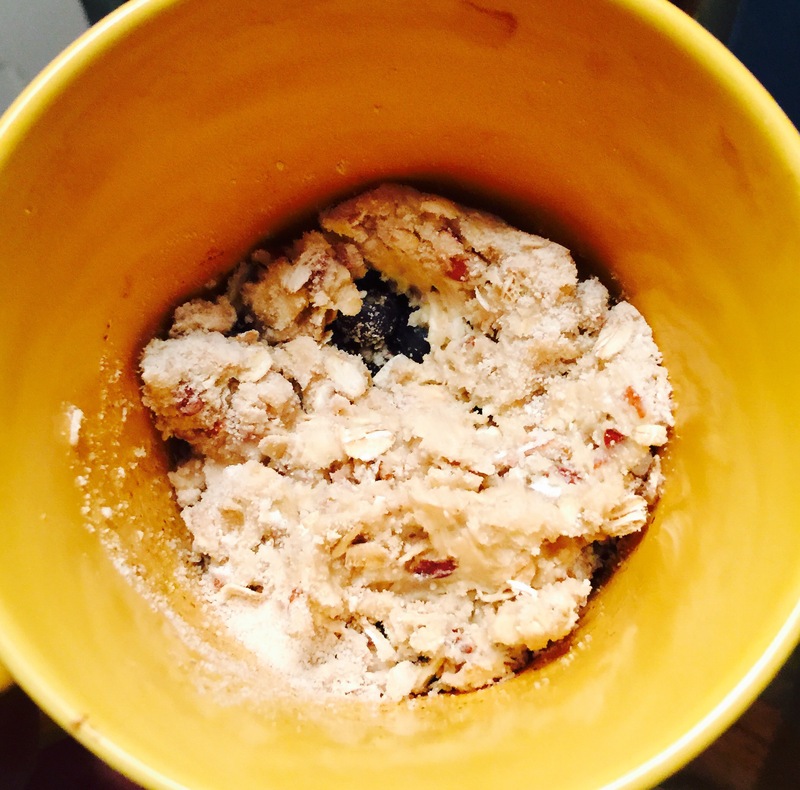 I started with 1/2 cup of fresh blueberries in a mug. I added a sprinkle of cinnamon and a small spoonful of brown sugar and mixed well. I deliberately avoided using standard measuring spoons. 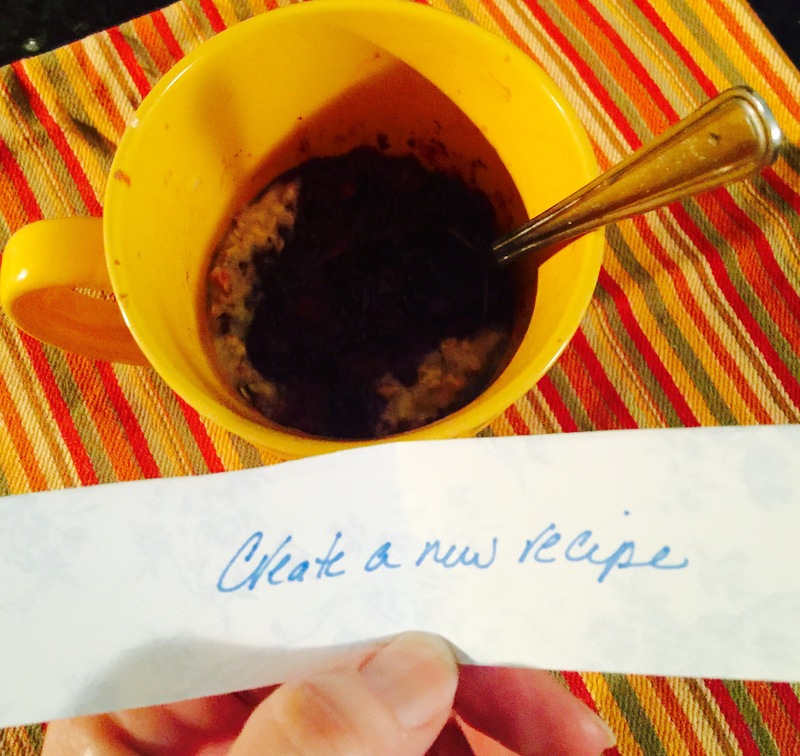 In a glass measuring cup I combined a heaping spoonful of baking mix (Bisquick is a common brand), a heaping spoonful of rolled oats, a small spoonful of brown sugar, two drops of vanilla and threw in a handful of chopped pecans. After mixing well, I cut in a blob of butter, stirring with a fork until the mixture was crumbly. 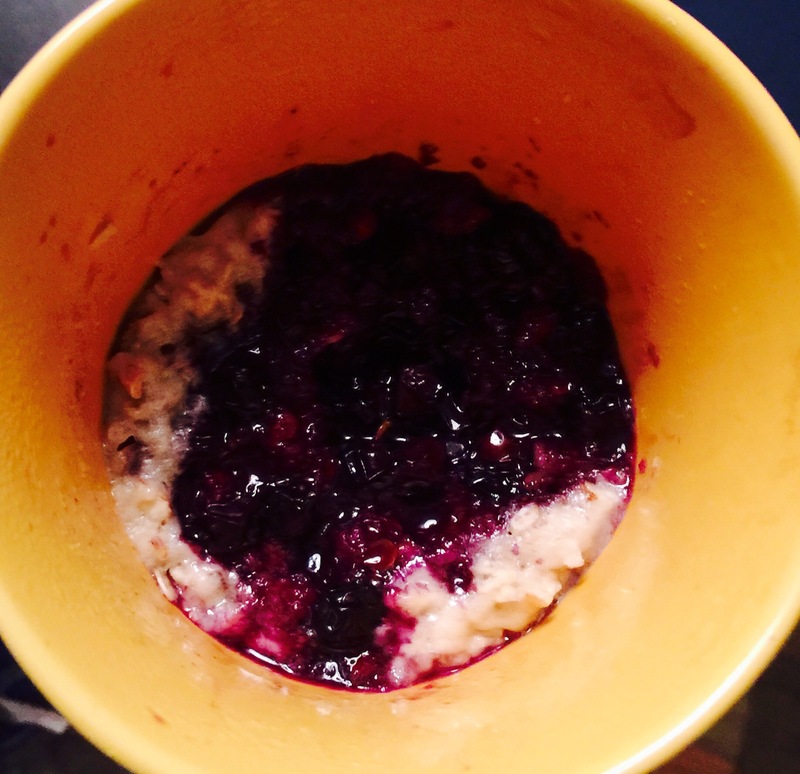 I topped the blueberries with the oat mixture and popped the mug into the microwave. Cooking for 30 seconds at a time, I checked the dessert after each interval, watching for the blueberry mixture to bubble up. It did, requiring one minute and 30 seconds total cooking time. I have to say, the Blueberry Surprise smelled wonderful. 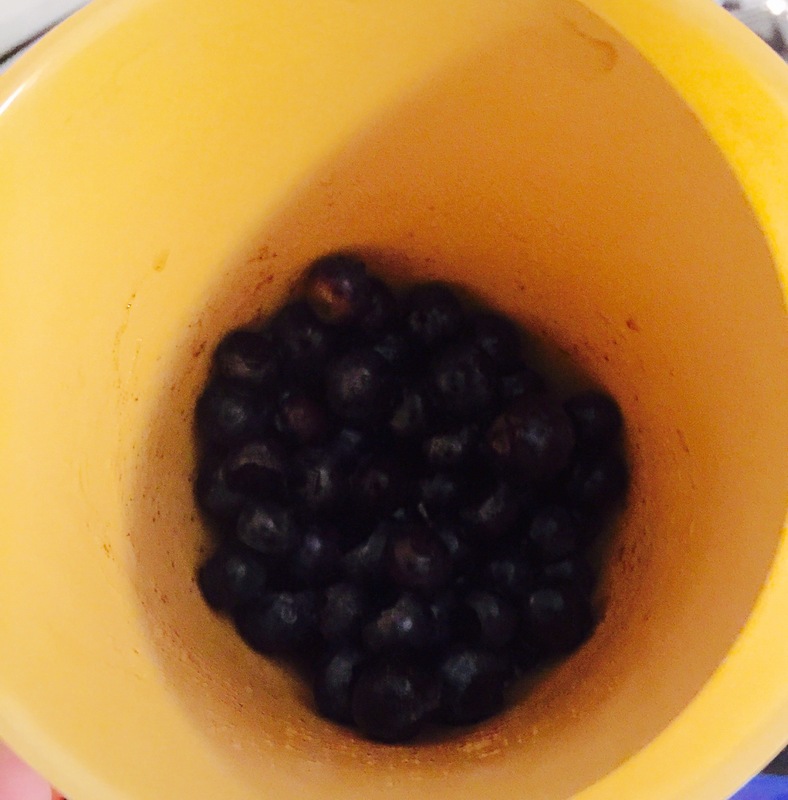 And that was the surprise part, in Blueberry Surprise. Would it be a disaster? Would it be edible? It was. It was delicious. I felt a bit like the little red hen, making something from food I picked myself. I learned tonight to let go of the outcome and perfection and rely on what I do know about cooking. I enjoyed not being precise. I chuckled at myself as I threw ingredients together. I could imagine my grandmothers standing with me, one on either side, smiling approvingly and giving each other a look. “She did it. She made a this and that dessert. Good girl.” They were my inspirations. 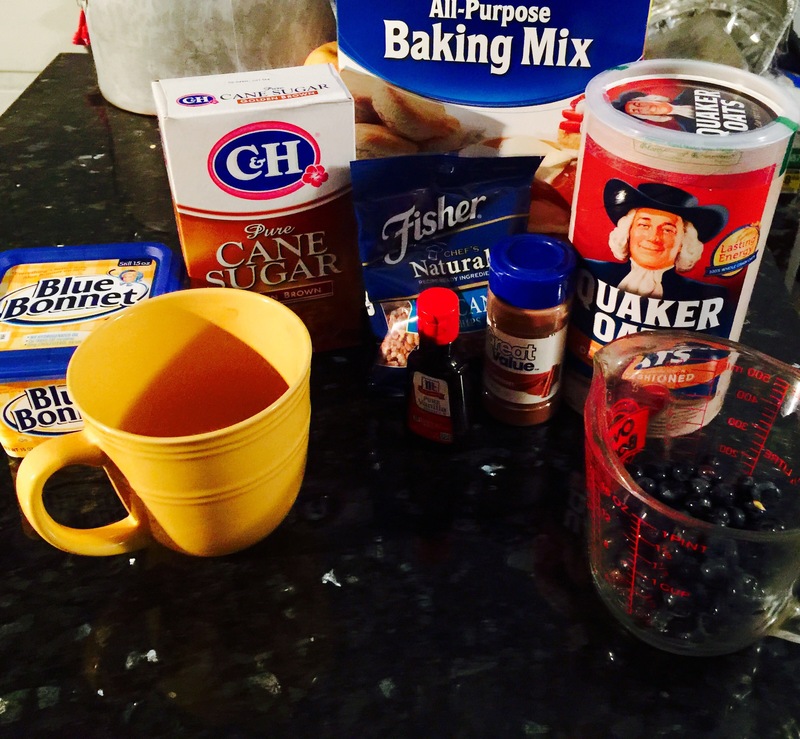 I wish I could give each of them a taste of my yummy Blueberry Surprise.